Attendance was way beyond expectations for the 6:30 p.m. Mass at the Cathedral Basilica of SS. Peter and Paul on Sunday, Nov. 30. It was the first Sunday in Advent and the start of the new liturgical year, so it was also the perfect time to highlight the World Meeting of Families next September. In honor of the event Archbishop Charles Chaput blessed small replicas of the official icon of the Holy Family that were distributed to families in attendance. In the end there were not enough to go around for all the unanticipated people who packed the cathedral, estimated to number more than 1,000. Folding chairs had to be brought out to seat some of the standing-room-only worshipers, while the shrines in the side aisles allowed many young children to stretch their legs during the Mass. 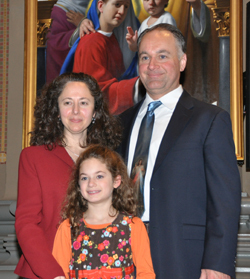 The image of the Holy Family that was painted by Kennett Square artist Neilson Carlin for the World Meeting “is the symbol of the most important unit in our personal lives, which is the family – our parents and grandparents, our children and spouses,” said Archbishop Chaput. “This is where the action is. This is where Christian life is learned and practiced in the best possible way. “The image you are taking home with you today is an image of the Holy Family and you are called in your families to imitate them, to be holy in the same way they are,” the archbishop said. “I couldn’t believe the crowd,” said Donna Farrell, executive director for the World Meeting of Families, who attended with her family. “The parking lot is filled to overflowing. It is just more exciting than I could have imagined. 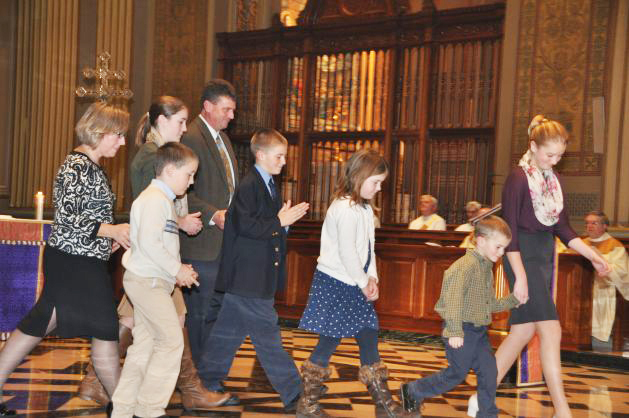 Most remarkable was the number of large families with their well-behaved children at the Mass. “We are here with our seven kids,” said Bob Tryzsbinski of St. Elizabeth Parish in Upper Uwchlan. With him were his wife Alicia, who you might guess has Irish heritage, considering the children were Connor, Donovan, Sean, Clare, Brendan, Bridget and Kathleen. “We are very traditional and love the World Meeting of Families and are happy to have this year to celebrate it,” Bob said. Mike and Marta Volpe, from St. Teresa of Avila Parish in Norristown, were there with slightly over five children — Micah, Cecilia, Lucia, Tobias, Magdalena and the little one yet to be named that Marta is carrying. “We’ve known about the World Meeting all along and we heard about this Mass yesterday and thought we should come,” Marta said. 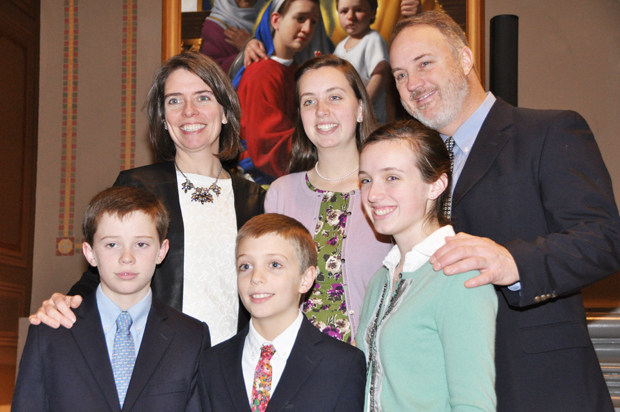 “This is so important and the picture of the whole family including the grandparents is beautiful,” said Tullio Falini from St. Agnes Parish in West Chester. Attending the Mass in addition to his wife Nancy were four of their children, Francesco, Analisa, Teresa and Patrick, and grandchild Mia Rose. 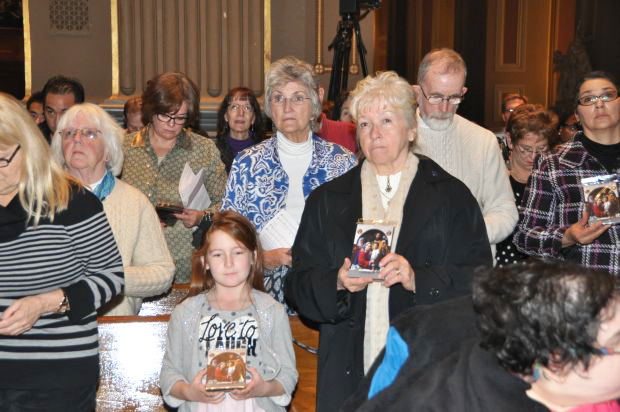 R.J. Snell, his wife Amy and children Grace, Emma, Mather and Clara, of Our Lady of Lourdes Parish in Philadelphia, helped distribute the replica images. Mae Carlin didn’t have any small children with her, but she thought the official painting of the Holy Family was “a masterpiece,” as well she should, considering the artist, Neilson Carlin, is her son. “I think the celebration is timely. God will do great and marvelous things,” she said. It was composed by Normand Gouin, who is a former music director for Old St. Joseph Parish in Philadelphia. A liturgical composer now at College of the Holy Cross in Worcester, Mass., Gouin has created other pieces for the Cathedral Choir in the past. The hymn was sung for the first time during the offertory procession of the Mass Sunday night by a small group of Cathedral Choir members. The text was written by nationally known liturgist Norbertine Father Andrew Ciferni of Daylesford Abbey, formerly from South Philadelphia. “With its powerful words and melody, ‘Sound the Bells of Holy Freedom’ is an excellent choice for our official hymn and I hope it encourages all who hear it to deepen their daily relationship with God and with their own families in significant ways,” Archbishop Chaput said. Sound the bell of holy freedom; call all nations of the earth. Sons and daughters of one Father, sent to spread God’s saving Word. Come, and gather, as one fam’ly at the table of the Lord. David branch from root of Jesse, Mary that vine’s flow’ring rose. Overshadowed by the Spirit, by her “yes” new life arose. You did shelter and provide for wondrous child by kings adored. Open to God’s Word in dreaming saved your child from Herod’s sword. Guest and host at Cana’s wedding, finest wine you did provide. You, our rock, and you our shelter, keep us ever by your side. With all mothers and their children, Blessed Mary, you are one. In our joys, and in our sorrows may we do as you have done. Through the love of Christ our brother, in the Spirit make us one.